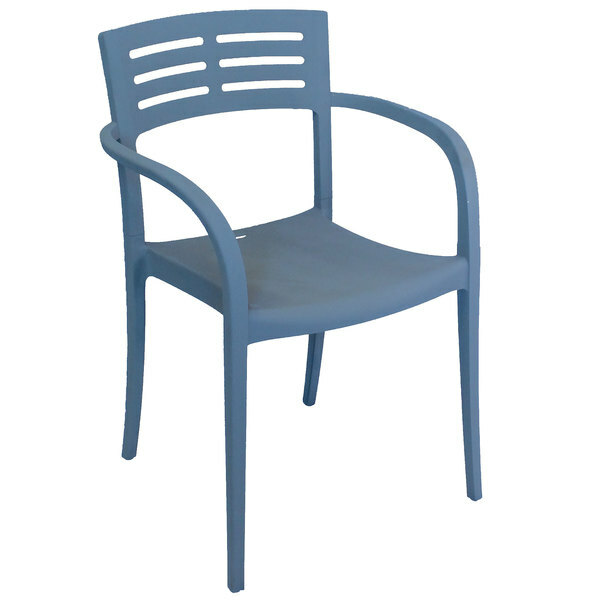 Add comfort and style to your dining establishment with this Grosfillex US633680 / US336680 Vogue denim blue resin stackable armchair! This chair features an attractive denim blue fiberglass-reinforced resin frame that is lightweight, yet durable for long-lasting use. Its contoured back provides optimal back support to ensure maximum comfort, while its arm rests provide stability and make it easy for guests to slide in and out of tables. This chair's legs are capped with glides to protect your floors from scratches or scuff marks. Boasting an ample 300 lb. capacity, this durable armchair guarantees comfort as guests enjoy your indoor dining area or outdoor patio!